Dhoni? 'I don't know him, Priyanka Chopra. Back Dhoni? 'I don't know him, Priyanka Chopra. If Priyanka Chopra is right, Dhoni has not been visiting her on the set and she has not bought gifts for him from France. "I don't know him, actually," she says. That leaves Deepika Padukone, if not in the field at least in the spectator's box, watching Dhoni play. The spotlight, in the past fortnight stayed firmly on Bollywood’s leading ladies and some of the credit must go to Team India’s skipper Dhoni, or Mahi as he’s popularly known these days. He set the ball rolling when he reportedly confessed to a crush on newbie Deepika Padukone- her appearance at Brabourne stadium only fuelled the speculation. The news may have broken several hearts but what made the matter even more intriguing was the fact that just a day ago a leading news channel had been running a story about Priyanka Chopra’s newfound interest in Dhoni. And while we were busy figuring that one out there was something about Yuvraj Singh being besotted by Sonam Kapoor of Saawariya fame! The other romance that was making news was Rani Mukerji and Aditya Chopra as also Kareena-Saif-Shahid. Even as Mukerji rubbished all suggestions of a romance with the reticent Chopra Junior, the news channels crowed about an impending wedding at Jodhpur’s Umaid Bhawan Palace. And Kareena Kapoor set tongues wagging when she made an appearance at the Lakme Fashion Week with Saif Ali Khan in tow. Clearly this was a week when the ladies had a head start. The only male actors who were close contenders were Sanjay Dutt and Shah Rukh Khan. Ranchi: Cricket's poster boy Mahendra Singh Dhoni today hits out at media for linking him with Bollywood heroines Deepika Padukone and Priyanka Chopra, terming the speculation as a media imposition. "You are changing one (heroine) after two days and another after three days. When you are doing a programme imposing links, let it continue for some time," said a smiling Dhoni with a tinge of irritation as a dazed Jharkhand Chief Minister Madhu Koda looked on. 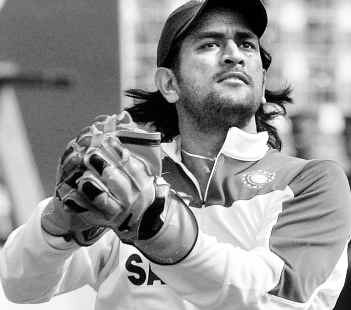 A few television news channels showed footage speculating Dhoni's off-the-field life. Asked how cricket changed his life of late, Dhoni quipped, "Earlier, there was one OB van (near my house) and now I find seven of them lined up." Dhoni arrived here yesterday for the first time after winning the Twenty20 world championship and the tough one-day series against Australia which India lost 2-4.